I note that pictures of the Milky Way "interacting" with Earthly sceneries often become APODs. Maybe a little too often for my tastes. But I like today's APOD. As usual, I'm fascinated by the individual stars. Fortunately, the stars are bright and colorful and are seen just in front of the Milky Way, which makes them easy to identify. But Avior is some 5,000 times as bright as the Sun, or at least 20 times brighter than Arcturus! Both Avior and Arcturus are classified as "giants". Arcturus is classified as a K2III star (okay, K2IIIp), while Avior is classified as a K3III+B2V star. The classifications are similar, and the presence of the blue B-star in Avior explains the overall "orange paleness" of this binary star. But how can we explain the difference in brightness between Avior and Arcturus? Avior is certainly at least 20 times brighter than Arcturus, and in my experience, when I have used my software Guide to check the Hipparcos parallaxes and the intrinsic luminosities that can be derived from them for various stars, stars of spectral class B2V are almost never optically brighter than 1,000 L☉, and indeed they are hardly ever even that bright. Since Avior is classified as a binary star with components of spectral classes K3III and B2V, we are still left with an evolved star of spectral class K3 that is classified as a "giant", not a "bright giant", and still its optical luminosity must be at least 4,000 L☉. Take it from me: You can't look at a star's spectral classification and guess how bright it will be. So what about the other orange star, the one at upper left? That's Lambda Velorum, and its B-V index is indeed redder than the B-V index of Avior, +1.66 versus +1.19. Lambda Velorum is also classified as either a "bright giant" or a "lesser supergiant", K4Ib-II. The "K4" means that the star is cooler and in all probability larger than the evolved component of Avior, whose classification is K3III. But guess what, Lambda Velorum is less bright than Avior in optical light: some 3,000 L☉ versus at least 4,000 L☉ for Avior. If there is a stellar category of "bright stars getting no respect," Avior probably holds the record. Yes, because no one seems to know much about Avior, and no one seems to care much! But the star is remarkably bright! It's not like me to talk so much about two orange stars, is it? Ah, but there is one strikingly blue star in the picture, too. And guess what star that is? It is Gamma Velorum, the star I talked about in the recent APOD featuring the Vela supernova remnant. In my comment there, I said that Gamma Velorum is not sitting in a reflection nebula, even if the APOD in question suggested that it does. But now take a look at the appearance of Gamma Velorum in this APOD (at top). Surely there is a large blue halo surrounding Gamma Velorum! The star is "burning blue"! And just because I talked about the spectral classes, B-V indexes and optical luminosities of Avior and Lambda Velorum, let's look at these things for Gamma Velorum, too. Spectral class: WC8+O9I. (One hot but shrunken Wolf Rayet component and one supergiant of spectral class O9.) B-V index: -0.145. (Not as blue as I'd like, but I would guess that the star is self-reddened due to the dust that is likely produced when the winds of the two components collide.) Optical luminosity: Almost 20,000 L☉. Bolometric (total) luminosity: Perhaps 280,000 L☉. Oh, and by the way, that faint reddish nebula seen below and to the left of Gamma Velorum is the Gum Nebula. You can see it better in the picture at left. It is thought to be a supernova remnant. And the bright white star at right in the picture is of course Canopus, the second brightest star in the sky after Sirius. Last edited by Ann on Sat Jan 12, 2019 7:33 pm, edited 1 time in total. Very nice composition, but, is it two photos stitched into one? That wouldn't make it a so called "fake" imo, unless it was two and the photographer is claiming that it was just a single exposure. Some info on how this was made would be nice, because an image like this is always going to be questioned. You need lengthy exposures for both top and bottom halves, with the camera tracking the sky and the camera fixed for the foreground I would think. A daytime picture of this nice little stream would be great to por favor. Ann, didn't mean to ignore your colorful comment, richly informative as usual, thanks. I appreciate your giving some orange stars some love as well. Suhail is like a new friend for me. Today's photo; very nicely done! I agree with BDanielMayfield. Ann, you can write all you want. You and a handful of others make this site more than just a collection of pretty pictures! Terrific work...Nicely done...you can see many things. Thanks so much, Tom (and Bruce)! Instead of editing my previous post, I'd like to add something that I have been thinking about. I said in my first post in this thread that Lambda Velorum, Suhail, is cooler and almost certainly larger than Avior, Epsilon Carina. I based that conclusion on these two stars' spectral classes: K4 Ib-II for Suhail, and K3III+B2V for Avior. But I take that back. In my earlier post, I said that the evolved component of Avior is noticeably brighter than Suhail, and I stand by that conclusion. But if that is true, then Avior can't be substantially smaller than Suhail, if it is noticeably brighter than Suhail. So I'd say that the evolved component of Avior is probably pretty much the same size as Suhail, or even slightly larger than Suhail. But the evolved component of Avior is also hotter than Suhail. How can that be? Typically, the brightest orange giants and supergiants are very cool and very large. But supernova 1987A taught us that stars can behave in ways we hadn't predicted, because the progenitor of SN 1987A was a blue supergiant, Sanduleak -69° 202. This star may possibly have been a red supergiant before, but if so it had shrunk and turned into a blue supergiant before it exploded. My point is that Avior, the strangely bright and strangely pale orange giant, may be in a transitional stage. Perhaps it is shrinking, and perhaps it used to be even larger than it is now. Perhaps it used to be cooler than it is now, and perhaps its temperature is rising as it shrinks. Thanks for all of the info, Ann! In that case, perhaps there will be more study of Avior, since that could be very interesting! So, the next thing Avior may "shed", is its title as "the bright star that gets the least respect". The ground portion of this image looks somewhat other-worldly. Hmmm. Perhaps I need to change my mind about Avior once again, or at least point out yet another alternative hypothesis. I used to think that you could estimate the true brightness of a star from its spectral class. I don't believe that any more. Yes, the spectral class gives you a good indication, but it most certainly isn't the last word on the subject. My point, which I am sure of, is that stars of the same spectral class come in different sizes. They may come with different masses and sometimes different temperatures, too. They may have grown or shrunk, or both, or they may have been born with different masses. Two different stars may have been born with different masses and still spent parts of their lifetimes with identical spectral classes and quite different luminosities. I 'm also sure that if you have two stars of the same temperature, but one star is larger than the other, then the largest star will (obviously) be the brightest. These stars belong to very similar spectral classes. AE Aurigae is O9.5Vvar, Mu Columba is classified as B1IV/V by my software but as O9.5V by Wikipedia. 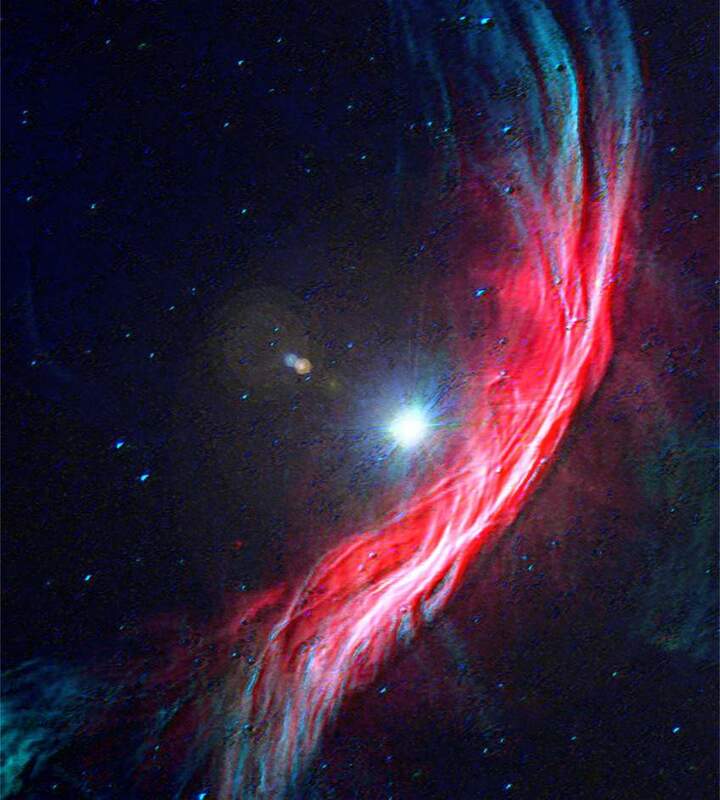 Zeta Ophiuchus is classified as O9.5V and Upsilon Orionis is B0V. And all these stars are about as bright as some 1,000-1,200 times the Sun. Careful, though. Zeta Ophiuchus is quite reddened, and AE Auriga even more so. Zeta Oph and AE Aur are intrinsically brighter than they look, because dust reddening has robbed them of a decidedly non-negligible part of their optical light. They are brighter than 1,200 times the Sun, at least AE Auriga. Okay, fine. But Mu Columba is particularly unreddened and particularly "blue". This star has lost very little of its light on its way from the star to us. Mu Columba is no brighter in optical light than some 1,200 times the light of the Sun. AE's temperature measured at 36,500 Kelvin (anomalously high for its class; 33,000 might be better). In either case, the star is very luminous, between 26,000 and 33,000 times the luminosity of the Sun (depending on the temperature and the allowance for ultraviolet radiation) and massive (at least 17 times solar, greater than Mu Col's mass) with a radius about 5 times that of the Sun. Note that Jim Kaler is talking about the bolometric (total) luminosity of AE Auriga, not the optical luminosity of this star. But note that AE Auriga is indeed more massive than Mu Columba and indeed more luminous, too. And yet these two stars belong to the same spectral class. Now lets look at Upsilon Orionis, the B0V star. According to its (admittedly very uncertain) Hipparcos parallax, Upsilon Orionis is a whopping 9,100 times brighter than the Sun in optical light. It resides in a class of its own compared with the three other stars I have mentioned here. The star is a whopper, a luminous class B0 dwarf (right at the edge of class O) at a most likely distance of 2960 light years. From its magnitude, the distance, and a temperature of 32,440 Kelvin needed to account for a lot of invisible ultraviolet radiation, we find a huge luminosity of 173,000 times that of the Sun, double that of Betelgeuse and Rigel, though not reaching the level of Theta-1 C.
Temperature and luminosity then conspire to give a radius of 13.2 times solar. The projected equatorial rotation speed of just 15 kilometers per second is low, probably because the rotation pole is more or less directed at us, as for such stars we would expect more than ten times that speed. Theory tells of a huge mass of 30 Suns, with distance uncertainties allowing a range of 25 to 35. Isn't it amazing? This obscure B0V fifth magnitude star, located some distance below Orion's sword, is twice as powerful as Betelgeuse and Rigel. And Avior, Epsilon Carina? Who knows. Maybe, like Upsilon Orionis, it was just born massive, large and luminous, and for some reason its spectral class doesn't do it justice. At all. That reminds me of something Paul wrote about 2000 years ago. 1 Cor 15:41 wrote: The glory of the sun is one sort, and the glory of the moon is another, and the glory of the stars is another; in fact, one star differs from another star in glory. It is indeed! Thanks for sharing all of those facts and deeper conclusions. I find many aspects of it all truly amazing.